It seems to me that many people’s fear is not proportional to the actual level of danger. It is more about a comfort zone, and what they are used to. Honestly – in my 30 or so years of adventuring, in very wild places around the world, sometimes travelling with others and sometimes alone, I have come across only one serious accident: a hiker in Patagonia who had a very bad fall, and ultimately ended up having his lower leg amputated. Then I go to some place like Toronto, and drive on those highways, the 401 and 400 and 407 etc. – I see thousands of people enclosed in metal and glass boxes zipping past one another at combined speeds of 200 km/h or more, apparently experiencing no fear! In spite of the fact that the radio is broadcasting a constant stream of info of serious traffic accidents, and that Ontario drivers simply get used to detouring past smashed-up cars every so often, some of which contain dead or injured bodies. Honestly, in all of my wilderness trips, I have never detoured past a dead body. City drivers just get used to this. And then think I should experience fear in the wilderness. I recall, back in 2000, when a drunk camper was bitten by a wolf on an island off of Tofino. The incident was headline news around the country. It happened that I had been photographing the wolves involved a few weeks earlier. So, next thing I knew I was fielding all of these media calls. I talked to one editor in her high-rise in Toronto. She was horrified by the idea of these wild animals appearing from the bush and attacking. I tried put to it into perspective for her. Something like 3000 people are killed in motor vehicle accidents in Canada each year. Hundreds of thousands of Canadians are bitten by dogs every year. On average, one person is killed by a wild animal across all of North America per year (a fraction of the number actually killed by domestic dogs). But Canadians are used to dogs – just as they are used to cars (and car accidents). They have lost their fear of the situations that present true danger, and instead fear what they don’t know: wilderness or wolves or bears. So what should we be afraid of? In my ideal world, we would all make the effort to become properly informed, and to define what truly are the dangers in our lives. Ironically, the wolves that were involved in that attack provide an example. 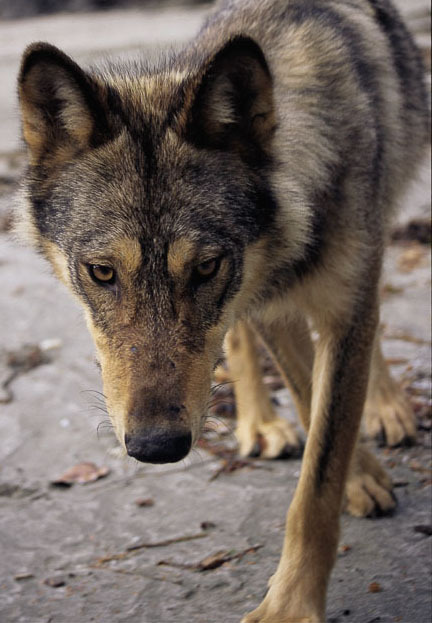 Those wolves had become habituated to humans. They had been around people so much that they had lost their natural fear of us. That is why I was able to photograph them, it is why they ended up close enough to a drunk camper to end up biting him, and it is why they were shot. And that same habituation or desensitization is happening to us now. The things that are most dangerous to us are so intermingled with our daily lives that we do not fear them: fast food and lack of exercise; far too much sugar in the North American diet; cars and car accidents; our industrialized way of life and what that means for global warming and coming food shortages. These things are already killing thousands of people every year, and they will kill many, many thousands more. These are all very scary to me. Much more so than cougars and wolves and bears. ← You, too, can grow veggies – even if you don’t have a yard! Siempre le hemos tenido miedo a lo desconocido. Por esos el miedo a la oscuridad es tan común. Por eso hay que llevar más gente a que conozca la naturaleza, aunque solo la sienta un par de veces en la vida. Cuantos niños crecen pensando que la carne viene en envases, que las papas salen de los supermercados, que la tierra y plantas son las que estan domesticadas en su casa. Has visto este libro http://richardlouv.com/books/last-child/ aún no lo leo, pero tengo muchas ganas. Abrazos y sigue escribiendo que todas las semanas disfruto el blog.